Want to quit cable, without loosing access to broadcast TV? It’s actually pretty easy to do, with the help of a indoor HDTV antenna. These small devices can be installed near your TV, and can receive signals from as far away as 60 miles. This means you could potentially watch broadcast TV for free! If you’re looking for the best indoor antenna, this guide will help lay out all the options and point you in the right direction. To be clear, an antenna won’t help with cable channels like ESPN, FOX News, CNN, AMC, etc. However, depending on where you live, it may help you get live broadcasts from NBC, FOX, CBS, ABC and others – all for free! Below, find the best digital antennas on the market. These recommendations were selected based on a combination of physical testing, manufacturer specs, online research and third-party reviews. 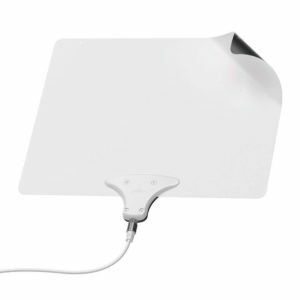 The Mohu Leaf 30 is a best-selling indoor antenna, and has been for many years. Mohu is one of the most trusted names in the industry, and this model in particular consistently earns good ratings in indoor antenna reviews. If you’re looking for our top all-around pick for best indoor antenna, this is it! One big benefit of the Mohu Leaf is it’s ultra-thin design. It’s practically paper-thin, and is designed to be hung up behind or above your TV. You can even paint over it to help it blend in with your wall! Of all the products on this list, this is definitely the most discrete option. So if you’re worried about an indoor antenna changing the look of your space, there’s no need to worry with the Mohu. See our Mohu Leaf 30 review for details. Click here to learn more about the Mohu Leaf 30! The ClearStream 2V from Antennas Direct is a great option. It’s unique in that it can be used inside OR outside, as it’s small enough to fit behind a TV, but durable enough to stand up to the elements outdoors. This dual functionality is quite useful, as you’ll often find that the reception you get with an indoor antenna may not be as good as an outdoor option. With the ClearStream 2V, you have the flexibility to try both! We picked this as one of the best indoor antennas because it works well, is priced affordably, and receives great ratings in indoor antenna reviews. It’s got a 60 mile range, dual VHF/UHF bands, and a durable construction. The company behind this antenna is known for great customer service. There’s even a lifetime warranty on parts! 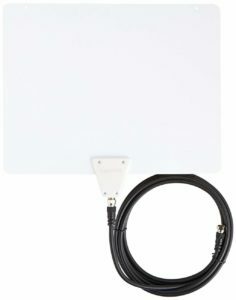 Looking for a cheap indoor antenna? This one from AmazonBasics is a good choice. At around half the price of similar models, this antenna is a steal of a deal – yet it still works quite well! It’s got a bit shorter range than name-brand competitors, but overall it’s quite similar. With a range of up to 35 miles, this is a versatile little antenna. It’s also reversible, with one side being white and one black. This helps it blend in with your room, and it’s so small that it’s easy to hide anyways. 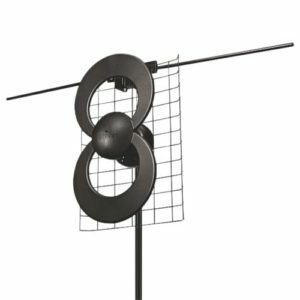 The Winegard FL5500A is a great choice for those looking for an amplified antenna. Amplifiers help to improve the signal, making this model the most long-range of any similarly styled antenna. It boasts a range of up to 50 miles, and can pick up both VHF and UHF in HD. Winegard is a trusted name in the antenna industry. They have been designing antenna hardward since 1954, and have earned a reputation for quality and consistency. 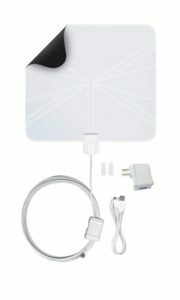 Looking at indoor antenna reviews, Winegard has maintained that quality with this product. The Mohu Leaf Metro is specifically designed for city slickers. This ultra-thin setup can hang above your TV or on a nearby window, and should pick up channels within 25 miles. The limited range means you’ll only get nearby stations – but most major cities have broadcasting stations very close by. This version of the Leaf is very similar to the original Leaf, in that it’s ultra-thin, reversible, paintable, and very easy to disguise. We also like that it’s very affordable and easy to set up. Indoor antenna reviews for this product are mostly positive. Click here to learn about the Mohu Leaf Metro! Indoor antennas are typically shorter range, and best for folks in cities and suburbs living relatively close to local broadcast stations. Indoor antennas are much easier to install, are generally pretty unobtrusive, and are usually cheaper than outdoor antennas. Outdoor antennas can have longer range, but usually require installation on a roof – which isn’t possible for everyone. For rural residents, outdoor is really the only way to get a decent signal. 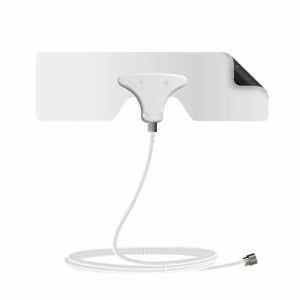 When deciding between an outdoor and indoor digital antenna, you’ll want to start by plugging your address into AntennaWeb to get an idea of what stations you may be able to pick up in your area. The video below does a good job of explaining some of the things to consider. You can also check our Best HD Antenna guide for some more product recommendations. Range – Signal range is just a guideline, but it’s a good place to start. Find out how far away your local broadcasting stations are, and then use this info to find an antenna with an adequate signal range. Keep in mind that various things can interfere with your antenna signal strength, so a range of 35 miles doesn’t necessarily mean you’ll get good signal from 35 miles away. Size/Style – Since most indoor TV antennas will sit somewhere in plain sight, you’ll want to consider how they look. Some of the ultra-thin ones can be hung on the wall and even painted to blend in, but you’ll still want to think about how the antenna might look in your space. Manufacturer Reputation – Make sure you’re buying from a trusted company in the antenna world. We usually recommend sticking with Mohu, Winegard, or Clearstream. Reviews – Check indoor TV antenna reviews to see what other people think of each product you’re considering. Be careful – there are a LOT of fake reviews on Amazon and similar sites. Be wary of any reviews that seem TOO good, and use a site like FakeSpot to weed out low-quality products.